It was war time 1942, and my Mother was in a beauty pagent running for "Miss Columbia Steel". She won, and found herself the object of many men in uniform. She has always been my mentor in all things of beauty. I will always love you Glo A! This was one of her jewelry boxes that was actually a wood English tea caddy with shell inlay. She lined it with beautiful chartreuse silk that came off the hem of her Richard Tam opera gown. I added four of my favorite blue and green pearl pieces filled with rhinestones and assorted cluster earrings. The hues of turquoise and baby blues compliment each other and I can't help but think of the Caribbean Sea. The gold sea shells came off a broken charm bracelet from one of my Mother's admirers. The stars were her clip on earrings and the centerpiece a lovely broach. To see more After Glo bracelets, click here. For information and pricing, please email me. Oh my your jewelry is gorgeous!! I viewed several other posts and love what you do with vintage pieces!!! Wow, what beautiful and unique jewelry. The same goes for your mother!! What beautiful pieces! You are Very talented! I especially love the name you've chosen and how it ties back to your beautiful mother! What a tribute! 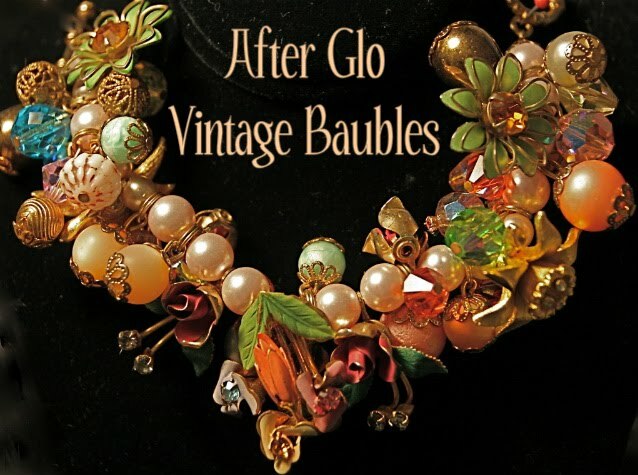 After Glo Vintage Baubles was created after inheriting my Grandmother and my Mother's costume jewelry. Motivated by the desire to see them come to life again, I recycled them into unique one of a kind bracelets and necklaces. The joining of old and new, inherited and hunted treasures are the inspiration behind my designs. 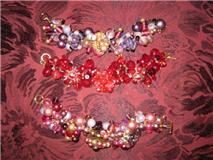 A trio of berry and reds to light up your holiday wardrobe! A sweet amber rhinestone cross necklace.